Josh Murray is the founder and sales and marketing director of Josh’s Rainbow Eggs. 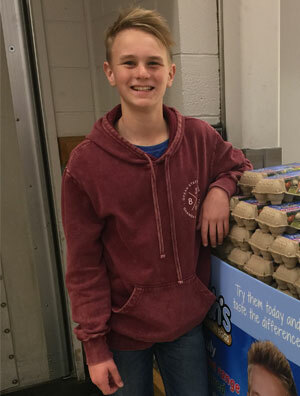 He is a budding entrepreneur whose Josh’s Rainbow Eggs cracked onto the business scene after a deal between Josh and his mother that if he looked after the hens, he could have all the money which kickstarted Josh’s pocket money making. He started selling eggs to his neighbours from his family’s farm when he was nine years old. Initially, he sold eggs to his neighbours for $4/dozen. He then expanded flock and set up shops at local farmers’ markets where he honed his skills in customer service. Josh’s Rainbow Eggs cartons now line the shelves of Coles, Woolworths and independent supermarkets. Being in business can be hard, but Josh has successfully taken on the challenge. His family’s fully-fledged egg farm produces 55,000 free-range eggs per week near Gisborne, an hour’s drive north of Melbourne. Josh is currently in his last year in high school and hopes to go on a Gap year to Sweden before returning to university to study either business or entrepreneurship.